Located on the far right of this picture (in the pink shirt,) I am a Fedora 9, 10, 11, 12, 13, 14, 15, 16, 17, 18, 19, 20, 21, 22, 23, 24, 25 and 26 user currently experiencing the x86_64 and i686 versions. I am trying to integrate useful system administration ideas for my Fedora systems. I am very interested in large memory model programs and multi-core computer systems. 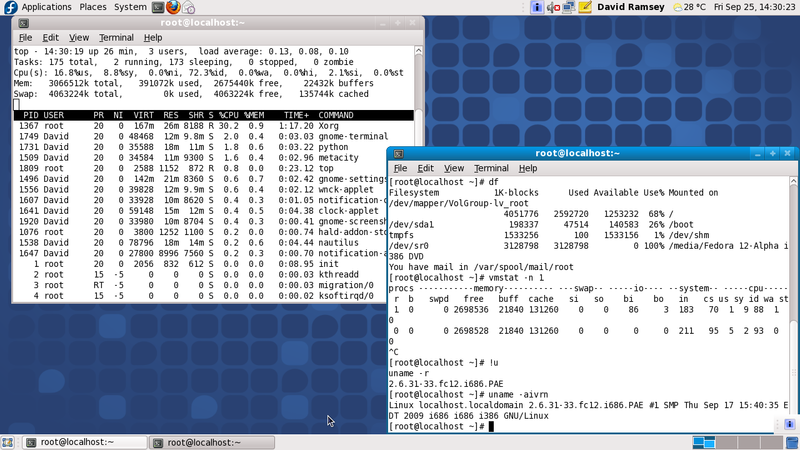 I enjoy using virtual machines (VMs) in order to develop a formidable system solution. 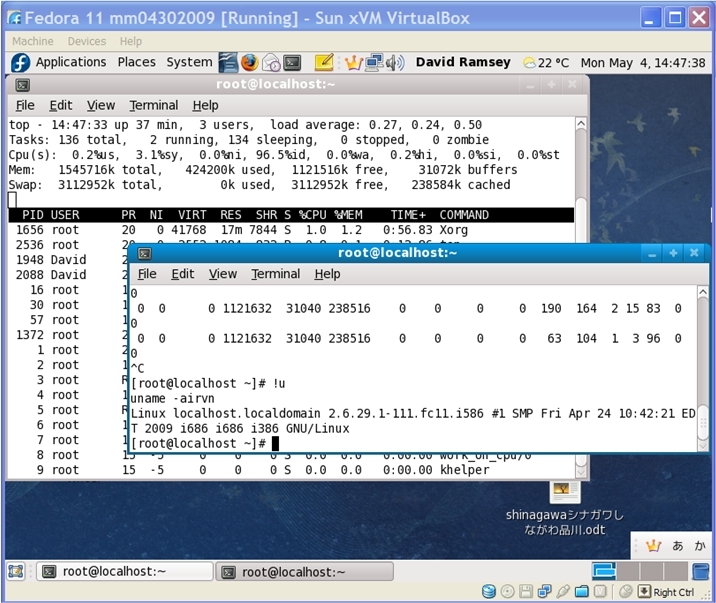 Through the use of VMs, I am able to try out a variety of software solutions on a VM prior to installation of the software on my production system. I have taken RH033VT, RH131VT, RH142VT, RH253VT, and RH301VT coursework, in order to further establish my Red Hat educational foundation. 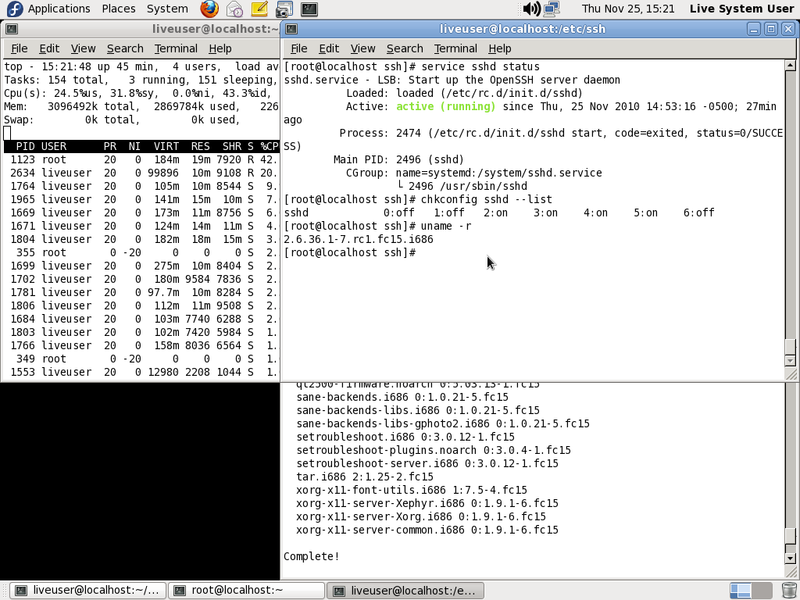 Recently, I have greatly enjoyed 24 hour access to the Live Access Labs running Red Hat Enterprise Linux 5. 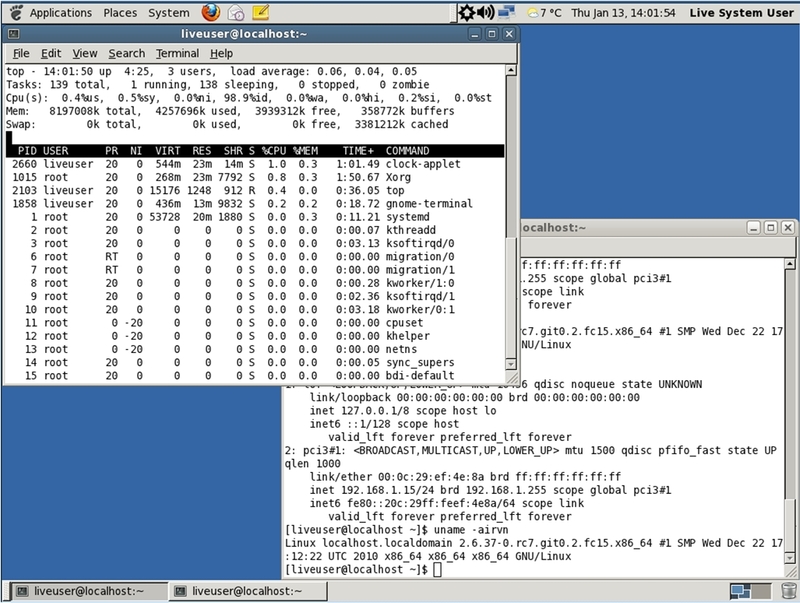 Now, I have the Red Hat Enterprise Linux 6 Beta running on a VM. Currently, I am reviewing "Building a Secure Computer System" by Morrie Gasser at the http://www.cs.unomaha.edu/~stanw/gasserbook.pdf URL and "Security Guide A Guide to Securing Fedora Linux Edition 14.2" at http://docs.fedoraproject.org/en-US/Fedora/14/html-single/Security_Guide/index.html URL. Each VM has either 3072 MB of RAM for i686 guest systems or 8192 MB of RAM for x86_64 guest systems as well as two CPU cores allocated for execution and evaluation purposes within an established baseline VM system. Good to see how the iBus Intelligent Input Bus "input framework method system" and Ext4 file system "checksum feature for the journal" have developed. Very interesting to see how the Yum Langpack Plugin and the Udisks disk management improvements are proceeding. 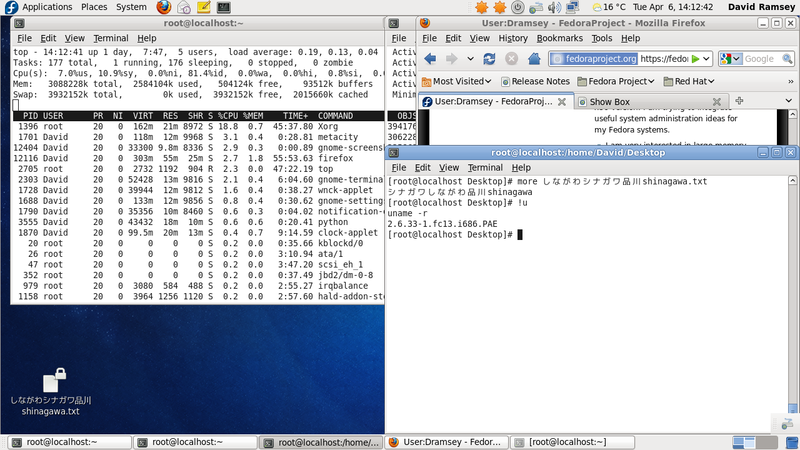 Left shows 1 VM with Fedora 11. 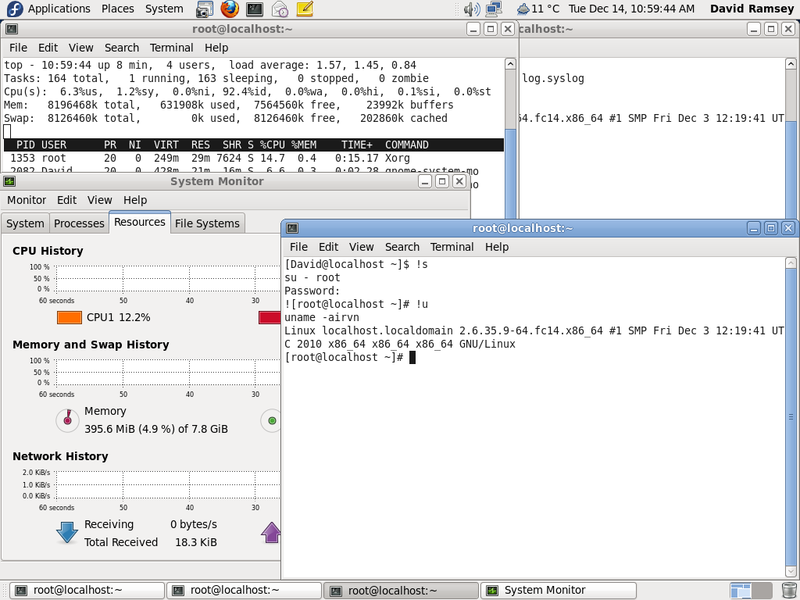 Center shows 1 VM with Fedora 12. 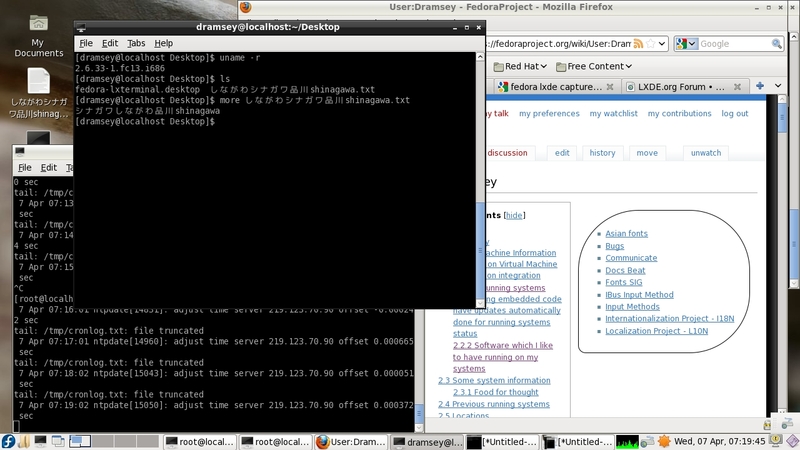 Right shows 4 VMs with 3 VMs on Fedora 9 and with 1 VM on Fedora 10. 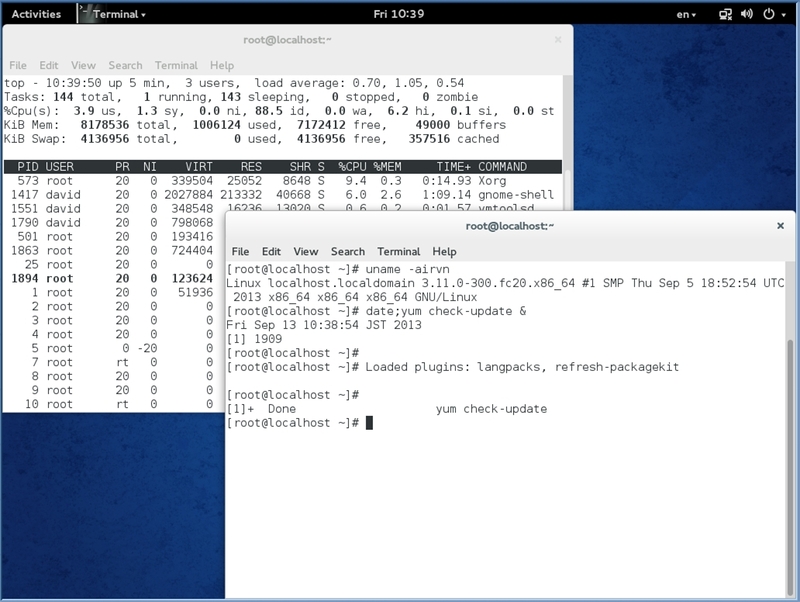 Where I get my x86_64 and i686 kernels - http://koji.fedoraproject.org/koji/packageinfo?packageID=8 Good information on http://kernelnewbies.org/LinuxChanges about Linux Changes especially the Linux 4.11 kernel. With 2017, another 24 cores and 192 GB of memory. Before I had been re-evaluating and determining how to best utilize the 96 cores and 336 GB of memory for effective systems. A periodic review of system resources is essential to providing an effective reallocation of system resources similar to the asset management theory. 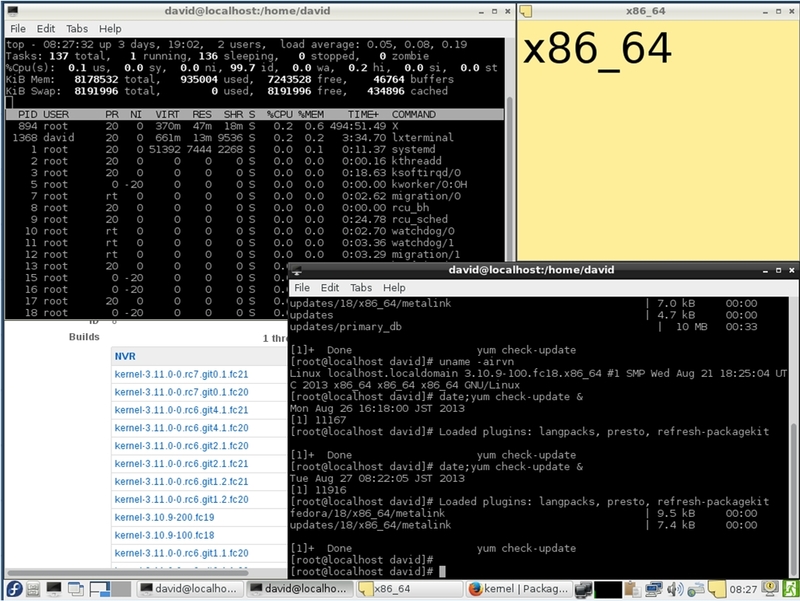 Seven x86_64 systems with two cores each, running about 112 GB of memory. Three i686 systems with two cores each, running about 12 GB of memory. Total allocated memory for systems will be ranging at about 124 GB of memory and will leave about 8 GB of memory free and four cores for the host systems operations. 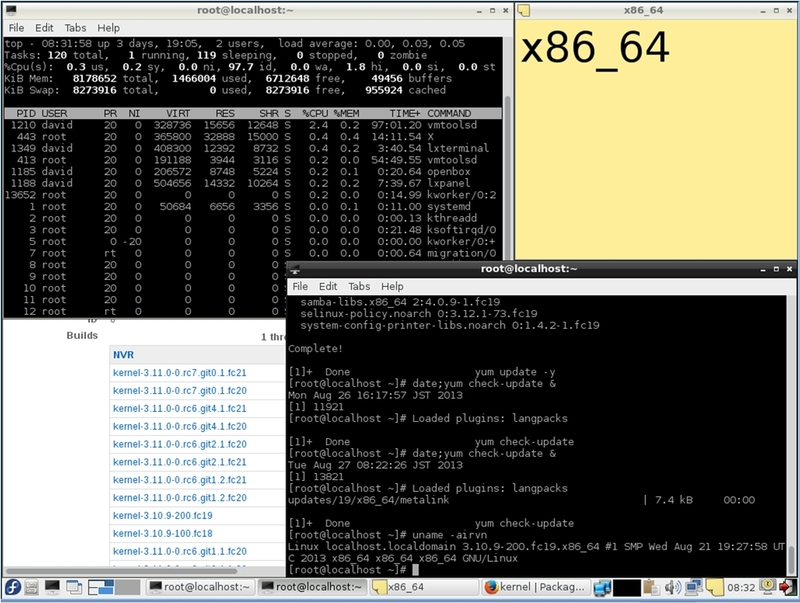 Eight x86_64 systems with two cores each, running about 128 GB of memory. 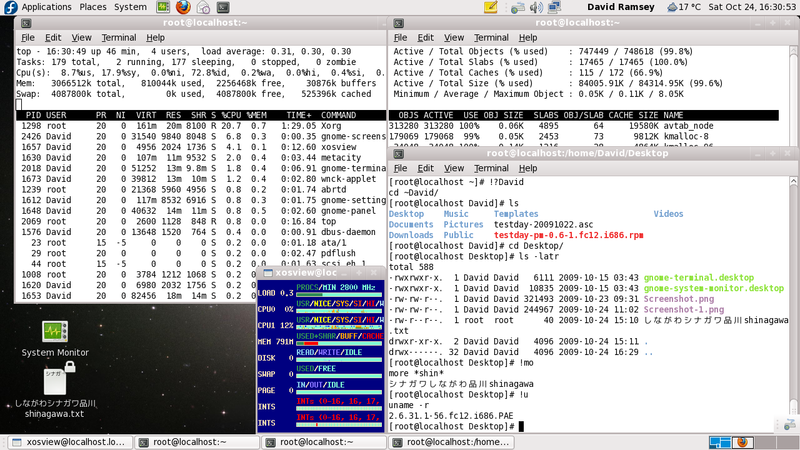 Two i686 systems with two cores each, running about 8 GB of memory. Total allocated memory for systems will be ranging at about 136 GB of memory and will leave about 56 GB of memory free and four cores for the host systems operations. Consider implementing High-Availability (HA) between the systems. 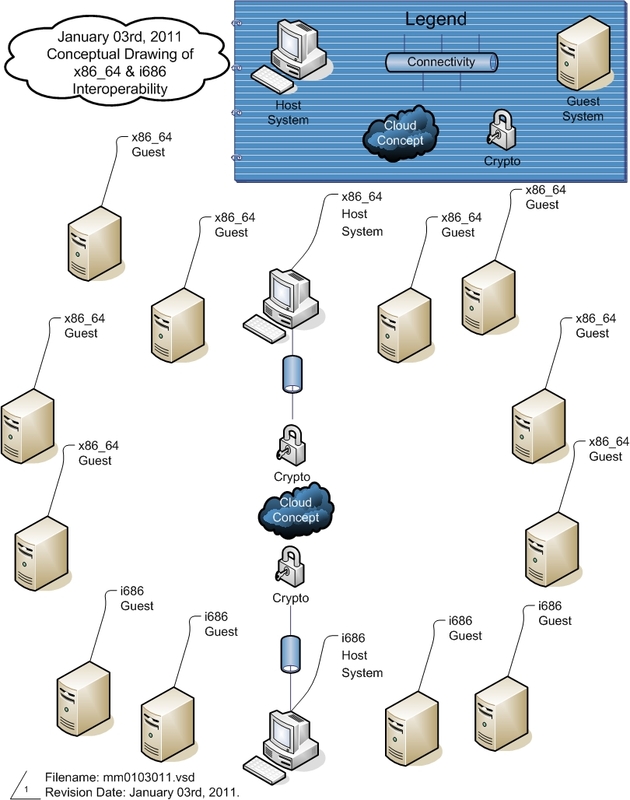 See the x86_64 and i686 interoperability system diagram for the system topology. Place SELinux reference URLs, here. Place Virtual Machine description URLs, here. Parallel Programming "Food for thought" - Is Parallel Programming Hard, And, If So, What Can You Do About It? With the new motherboard at Supermicro® 4-CPU H8QGi+-F AMD® SR5690 Supermicro® 4-CPU H8QGi+-F image with 4x AMD® Opteron™ 6272 2.1GHz- 3.1GHz Max.Turbo-64Bit 16-Core. 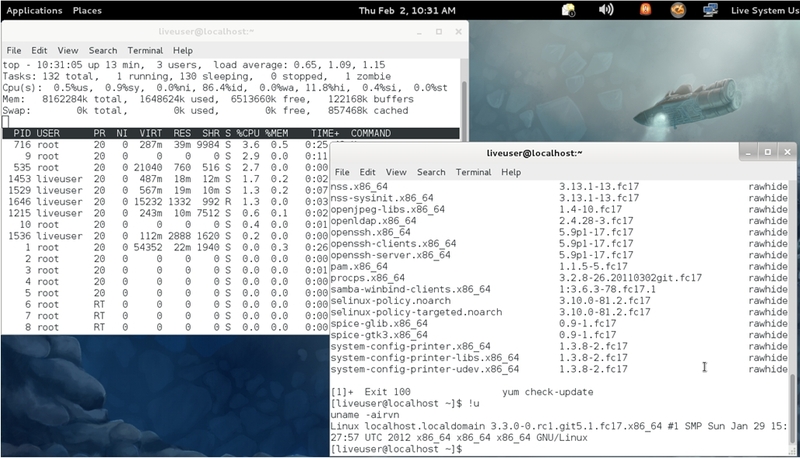 Total of 64 cores with an initial install of 64 GB of memory and a maximum 1 TB of memory. 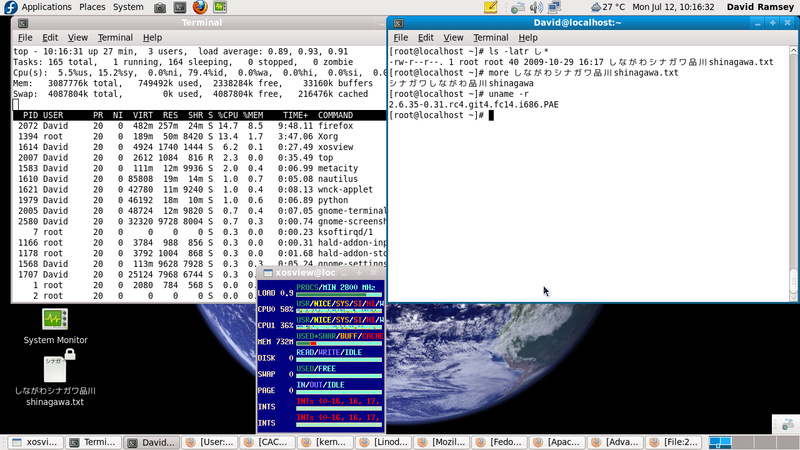 The total of 80 cores with 144 GB of memory is done. 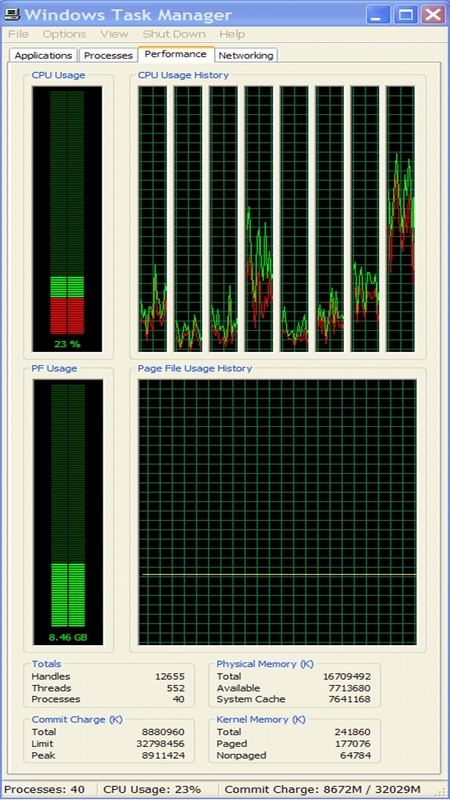 My current workstation has eight (8) x86_64 computing cores and 16 GB of RAM as well as four 500 GB harddisks (SATA Seagate 7200.12.) The Seagate 7200.12, 500 GB harddisk is only "one" platter and is very quiet as well as very low power consumption and fast for my use. I am considering a plan on doing an upgrade to the Seagate 7200.12, 1 TB harddisk next calendar year. Another workstation has arrived with eight (8) x86_64 computing cores and 64 GB of RAM. Google's IPV6 web site - http://ipv6google.com/ try it. A finding on my behalf regarding concurrent guest operating systems is to keep the ntp time clock in sync between the variety of guest VMs. 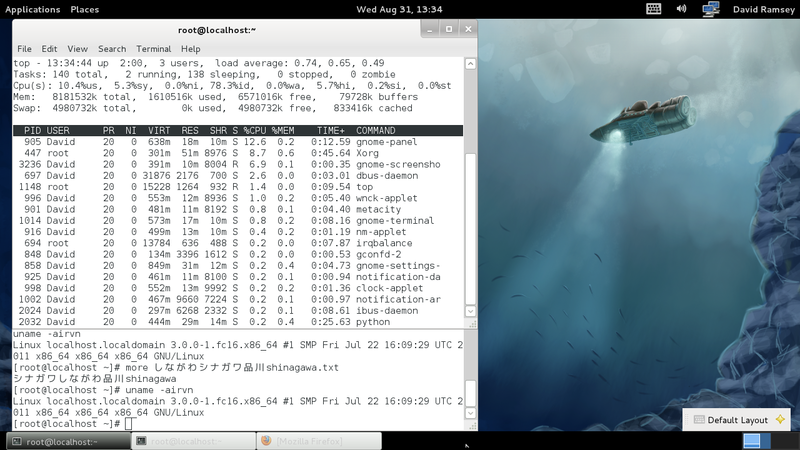 Fedora 12 Alpha with 3072MB of RAM. 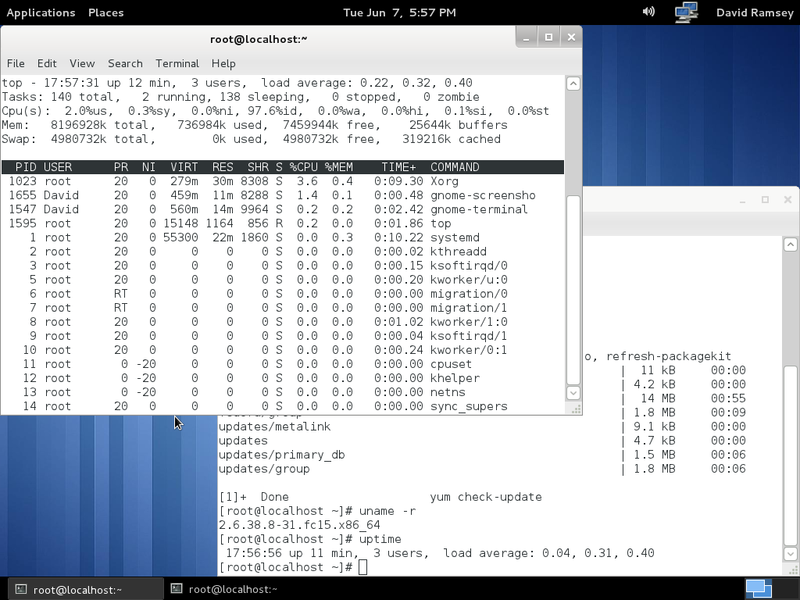 After that amount of 3 Gigabytes (GB) RAM, the 32-bit kernel is abending. 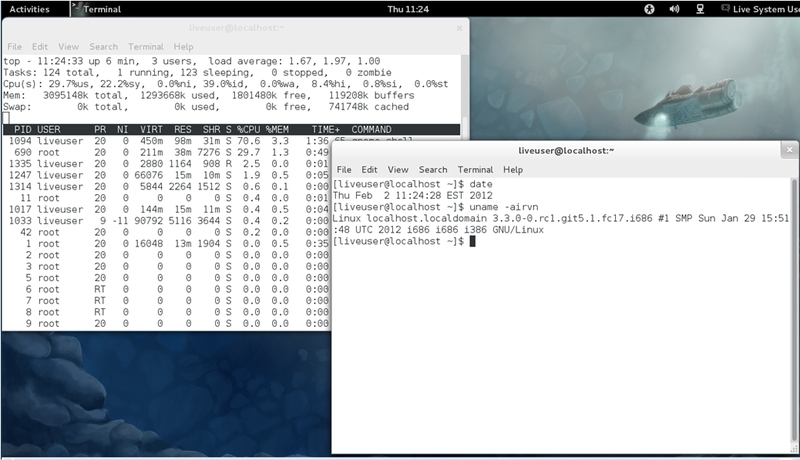 Also, the "Swap" space is defined about 4 GB. 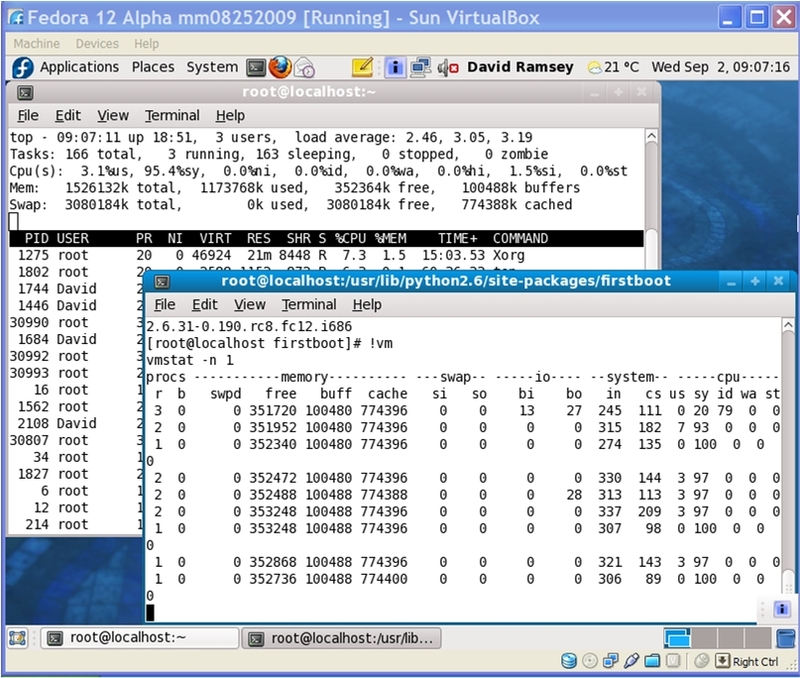 The Fedora 11 and Fedora 12 Alpha version's "Swap" space are defined about 3 GB, versus the Fedora 9 and 10 versions' "Swap" space are defined about 2 GB when all versions were provided 1.5 GB of RAM. At this time, I am not really very impressed with the dracut product. 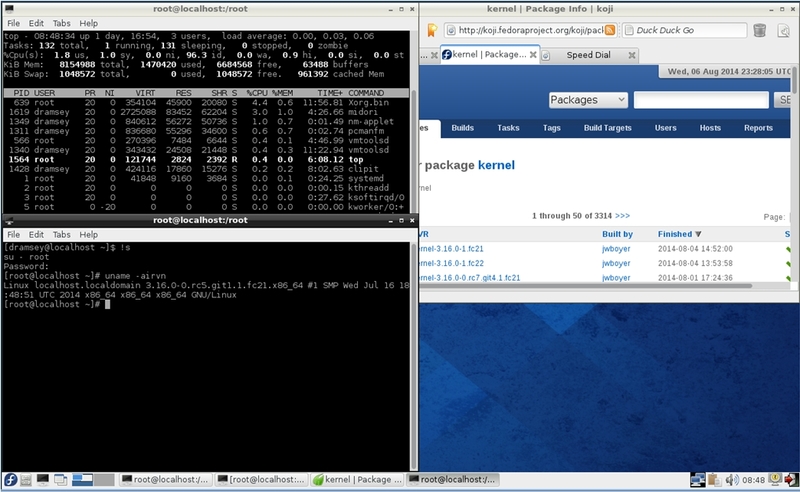 The dracut execution time was about 15-25 minutes to update my kernels dependent on the virtual machine being used. As of September 22nd, 2009, I have used dracut about 40+ times. Maybe when the F12 Beta and/or F12 Final Release are made, dracut will be better. Update, with F12 Beta and RCs, the dracut execution time is now about 2-3 minutes. A little FYI on updating to the 2.6.31-2.fc12.i686 and 2.6.31-2.fc12.i686.PAE kernels, a separate rpm install was needed of the bindutils-2.19.51.0.14-31.fc12.i686.rpm package from the original install media's iso, in order to address the bindutils dependency prior to updating to the 2.6.31-2.fc12.i686 and 2.6.31-2.fc12.i686.PAE kernels. Currently, the Virtual PC 6.0.156.0 and the F12 Alpha iso are having some serious problems with getting X to work. Therefore, my /etc/inittab file on those test subsystems is set to run at runlevel 3 instead of 5. I purchased my Fedora Polo Shirts here at, Custom-embroidered logo shirts and apparel by Queensboro located in North Carolina, for $9.95 each or Fedora Hat for $5.95, including shipping. The place is called, "http://www.queensboro.com/" use this information for the Fedora Logo. To facilitate phone calls around the world, I use unlimited world Skype for only $12.95 per month or free Skype to Skype chat, audio, and video for "Windows, Mac OS X or Linux" even for "iPhone." How do I know how many file descriptors are being used system-wide in Red Hat Enterprise Linux? This page was last edited on 29 July 2017, at 05:39.